Fixed total energy variometer response to thermals. Added new flight test site “Infinity Space” with no ground. Practice without crashing. This is a patch that requires V2.5 or higher. 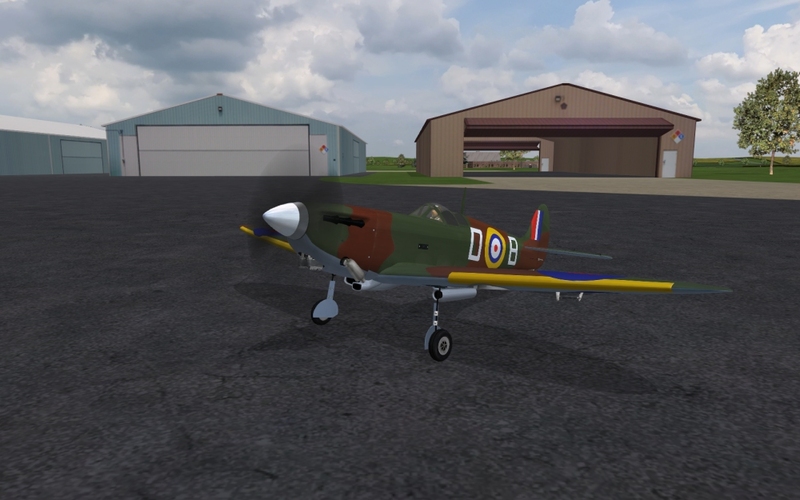 This update includes all previous V2 updates and aircraft. 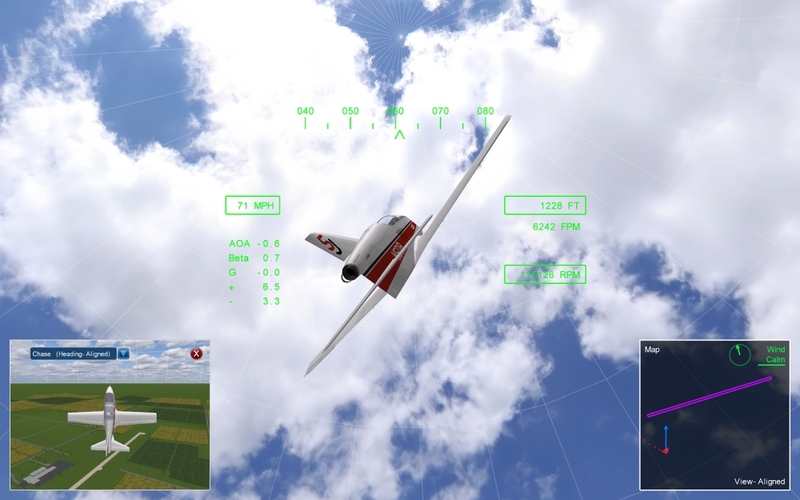 Added field-of-view (FOV) angle sweep to map display (‘m’ key), extending 800 ft from the pilot’s eye. Added support for multiple HUDs: simple (4 colors), intermediate (1 color), and full (1 color). Full HUD (last in cycle) is best viewed from F8 onboard cameras. Requires ‘h’ key to cycle. Fixed issue with hi-start rope calculations, improving accuracy. Created 15 new hi-starts (zip-start, up-start, standard, heavy duty, mega, insane, and epic) including information on recommended launch length for each. Added ability to use a captured tow hook, requiring ‘Insert’ key to release. Added time delay that locks the tow line to the aircraft for 3 sec to allow for startup/reset transients to decay. Added towline “thump” sound on hi-start/winch towline release for Supra sailplane. Changed smoke settings in Options |Smoke to make smoke more lifelike. Sized smoke for aircraft with wingspans around 100 inch. Requires resetting options via Options | Messages | Use Default Options on Shutdown. Improved apparent mass calculations in aerodynamics. Fixed occluding aircraft parts in rotating 3D aircraft selection views. Improved shadows to be darker at noon (high sun elevation angle) and gentler at sunset. Improved aircraft shadows, fading out with increasing distance from aircraft (along the direction of sunlight, not vertically), to approximate umbra becoming penumbra. Reduced flickering of numbers in heads up display (HUD). Updated runway coordinates to best fit for each flying site. Removed needing to press ‘j’ to restart heli motors. Added 100 ft high field camera to Arthur Field flying site, via F5 key. Fixed sometimes duplicated aircraft names in Recordings. Faster Runge-Kutta integration with equations of motion. Install instructions: After downloading the update, install the update as administrator. When complete, start FS One V2. When FS One asks if you want to install the updates from a trusted source, click “Yes” for each prompt (three times). These updates may take 30 secs to installed. If you are running Windows Vista and have questions about installing and UAC, see click here ». Improved smoothness of F5 camera view for 3D fields. Fixed texture glitch on house. Reoriented F8 bird’s eye view so that north is up (for some aircraft, e.g. SBach). Fixed spinner breakable part on UltraStick Lite. Disabled smoke for electric aircraft. 50%-scaled 102-in span model designed by Sean Cassidy (au117), maker of the prototype molds for Bill Hempel’s BD-5J. 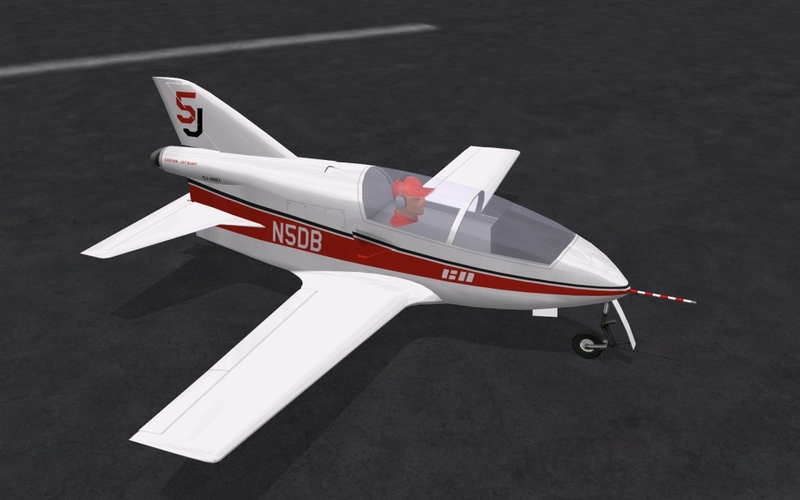 50%-scaled ARF designed by Bill Hempel (uses the newer JetCat P140-RX turbojet with 32-lb static thrust). Full-scale 17-ft span versions with 240-lb and 325-lb static thrust produced by the Microturbo TRS-18 jet engine. 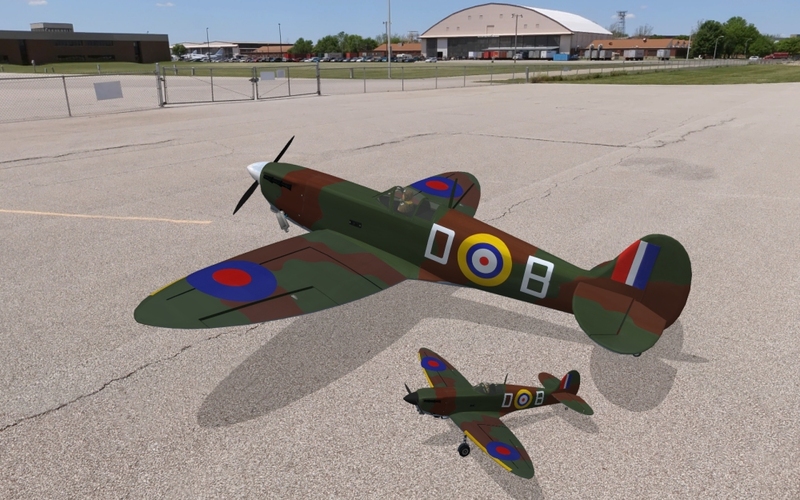 This update includes all previous V2 updates with Hangar 9 Spitfire, Focke-Wulf FW 190, Xtreme Machines Sbach 342, SIG Four-Star 60, Hangar 9 Cap 232G, Hangar 9 Extra 260, and variants. Cleanup: Removed channel string from Bobcat aircraft descriptions. Map (‘m’ key) now shows targets for bombs and rockets. Added racing pylons to map (in pylon race). Fixed minor bug in transmitter editor. Changed: pylon-racing timer changed from predicted finish time to current elapsed time. Also simplified current-lap display. Added support for changes to pylon racing setups. Works with pylon extras download (build 1372). 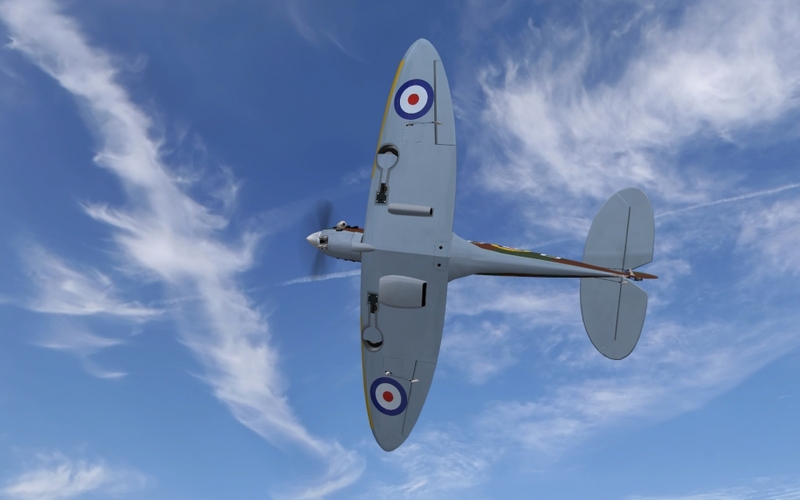 Changed braking on 33%-scale Spitfire from activation with down elevator to up elevator. Reduced volume for cut pylon buzzer (pylon racing). Updates to support new pylon racing features. To test out these new features, visit the FS One downloads page and install the Pylon Racing update (build 1372). Requires V2.1.3. 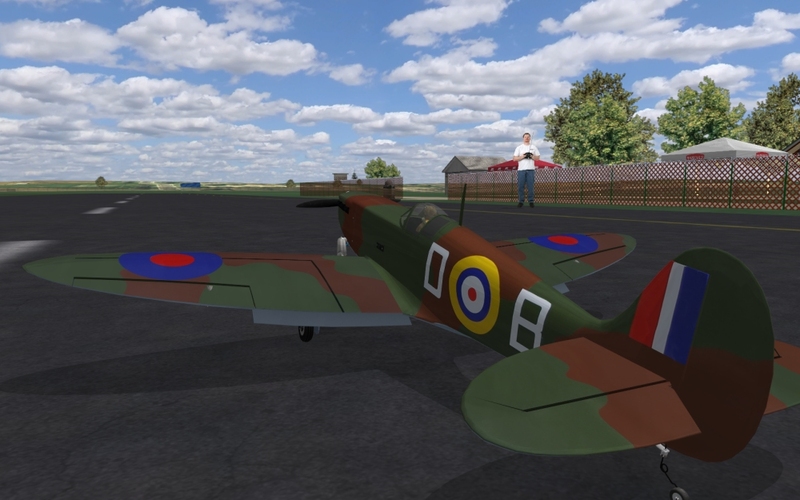 Added the Spitfire MK.II by Hangar 9 (wingspan: 65 inch) plus four variants in popular weights/sizes including a micro electric, slope glider version, 20% scale (88-in span) and 33% giant scale (146-in span!). This update includes all previous V2 updates with Focke-Wulf FW 190, Xtreme Machines Sbach 342, SIG Four-Star 60, Hangar 9 Cap 232G, and Hangar 9 Extra 260 and variants. Added tracking of maximum negative g-load and displays in HUD. Added dotted line aircraft flight path trace on map. Removed antenna from Firebird, Ascent, Alpha 40, and Stryker. Repositioned exhaust smoke on MiG15, P-51, T-34, and Texan. Improved pitch-yaw coupling for E-flite Ultimate and Extra 260 foamies. Fixed random missing smoke on Bobcat jet. Updated map for Arthur Field. Changed scaling in variometer. Now it’s 100 fpm per tick. Changed lag rate on variometer. Now it’s slower. Updates V2.1.0 beta. Changed elevator trim for Spitfire and variants. Fixed Scaling Wizard bug introduced in 2.0.8. Updated Help Manual and Flight Manual. Fixed minor aileron graphics issue on Sbach 342. Moved branded transmitters in Tx list to new menu category: “FS One v2 Others”. Add-Ons must be installed separately. This Extras includes the RCX Sbach 342 with a “Stability and Control Augmentation System” (SCAS) that relies on gyros in all 3-axes. As it sounds, the SCAS system (similar to other systems currently available for micro flyers) adds stability, and this is especially noticeable in turbulence. The system also changes the behavior of the control sticks. Rather than directly controlling the surface deflections, the control sticks (pilot inputs) drive the roll, pitch and yaw rates, i.e. they turn into ‘rate commands’. In this mode, rolling harriers, knife edge flight and many more aerobatic maneuvers become much easier while the control system does most of the work (watch the surfaces move on their own in rolling harriers!). Turn SCAS on/off with the gear switch (or key “0” for transmitters with only 4 channels). 25% scale (span: 102 in, weight: 36 lb) plus 20% scale variant (span: 79 in, weight: 17 lb). The 102-in span version is Giant Scale at 36 lb and similar to the Meister Scale RC model. The 20% scale is 79-in span with 17 lb and close to the Dave Platt FW 190 model. This airplane is the first in the FS One V2 Open Source Collection. 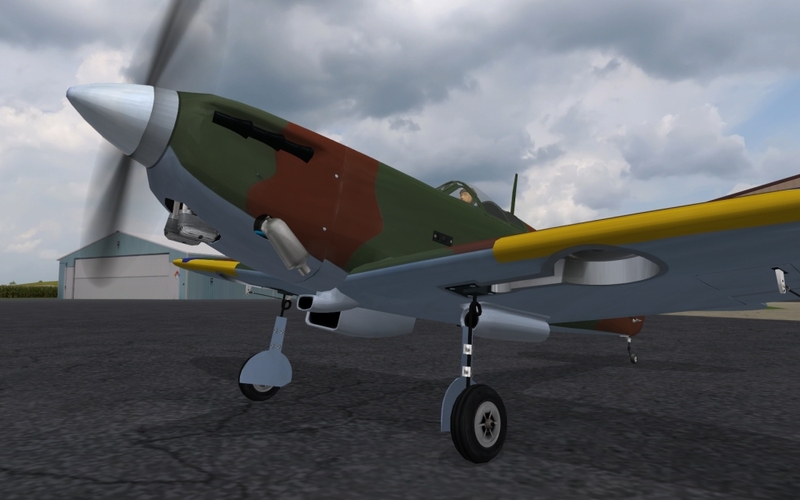 The open source graphics files for the FW 190 are originally from the open source FlightGear Flight Simulator and modified for use with FS One V2. These modified graphics files for FS One are also open source under the GNU GPL v2. As such, they are free to use, modify and distribute with few restrictions. Thanks goes to Karel Marciniszyn for converting this graphics model to work with FS One V2. We support the open source community and if you are interested in converting open source GPL models, please contact us. Added new FS One Rewind feature activated using ‘y’ key. Rewind back and start the maneuver again! Airframe and propeller must be set to indestructible in the main options. Corrected wobbly running propeller on Extra 260 and Sbach 342 airplanes. Added the Sbach 342 by RC Xtreme Machines, 40% scale, hyper-light (wingspan: 122 in, weight: 29.2 lb). Fixed hover assist feature on/off behavior. Reduced power on Cap 232 airplanes and tweaked idle engine sound level. Corrected ground strike propeller radius for SIG Four-Star 60. Changed “Sim Rate Multiplier” to “Physics Speed” in Options page. Removed residual propeller torque after crash with broken propeller. Fixed one tree texture graphics issue. This update includes all previous V2 updates. Added the SIG Four-Star 60 (wingspan: 72 in, weight: 7.5 lb). Added Ultra Micro Stryker with USAF trim (wingspan: 17 in, weight: 2.15 oz / F-27B Stryker variant). Added new hover training widget. Press ‘o’ to start. Added bomb drop targets near pilot position on runway. Updated to the Cap 232 and Extra 260 airplanes — more drag tweaks (a scosh higher drag). Updated flight training lesson names in list. Changed behavior: Flight training no longer changes airfield, sun/sky, wind selections of other flying modes. Changed behavior: max G load in heads-up-display (HUD) cleared after reset or instant-up. Included four Cap 232 variants in popular weights/sizes (wingspan: 80, 97, 108, and 130 inch). Updated Extra 260 35%-scale by Hangar 9 – lower drag, less pitch coupling with yaw, re-tuned mixes, added air rush sounds. Updated Brio – less pitch coupling with yaw. Updated Stryker – increased drag to account for wing surface roughness. Fixed bug with T-Rex heli gyro edit. 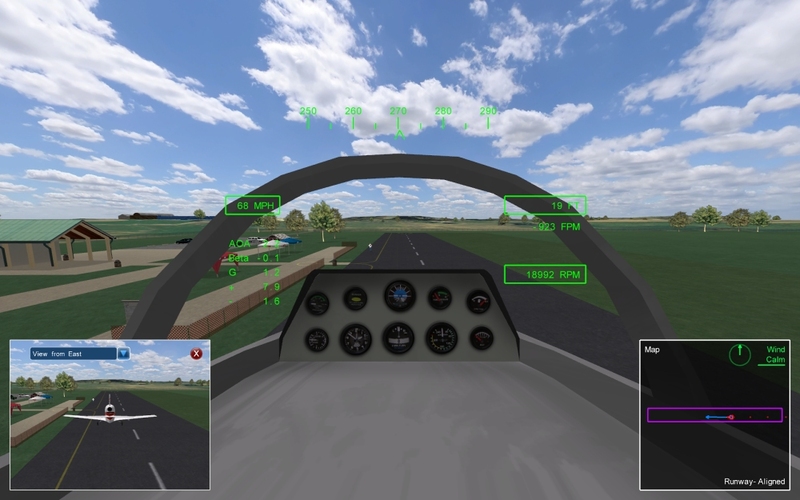 Updated edit Tx/servo interface – edit aircraft servos now disables edit Tx, and edit Tx now disables edit aircraft servos. Corrected Scaling Wizard report – weight includes fuel. Added support for 2048 resolution with new 2nd-Player FS One V2 USB Interface. 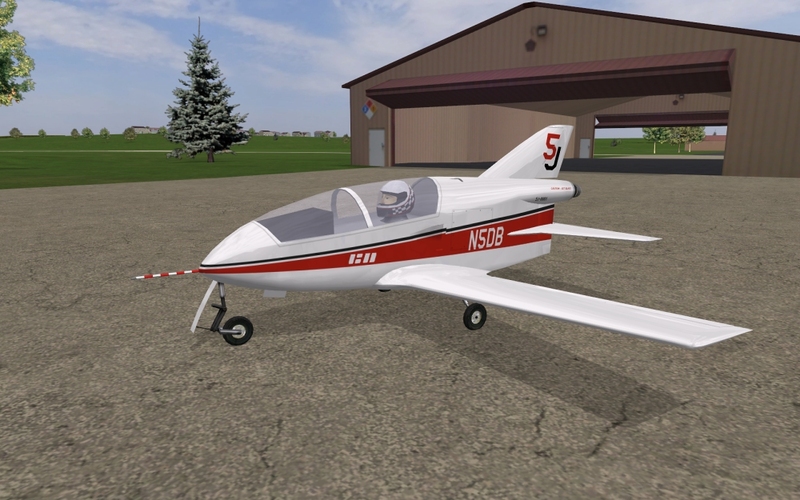 Updated Hangar 9 35% Extra 260 – added more crash sounds, reduced airframe crash airloads (breaks easier in flight), fixed propeller contact points, updated onboard camera views (F8). New airplane added: Hangar 9 35% Extra 260 (in beta). Improved multi-monitor support under Windows 7 and Windows Vista. Improved switching between video modes (e.g., 1280×1024 @ 60 Hz). Moved aerodynamics data overlay text to work on smaller screens (in beta). Added 8-Ch non-mixed Tx setup for control with real Tx computer radio settings. Added additional checks when saving and naming custom aircraft and transmitters. Clarified text in some dialog boxes. 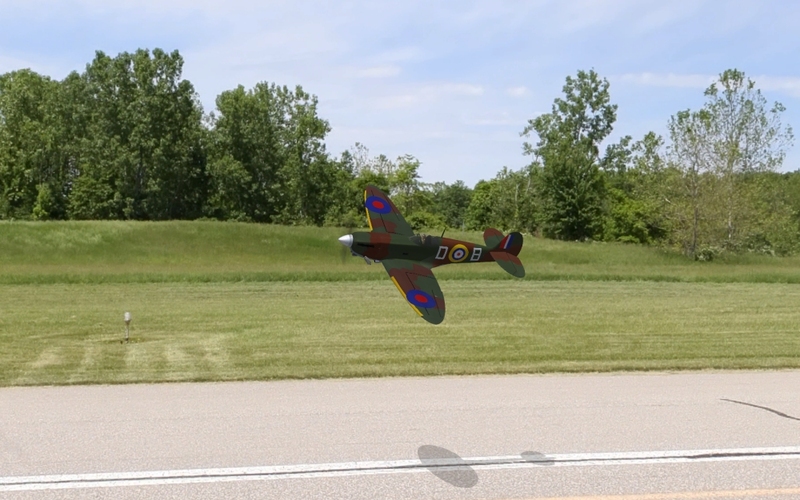 Corrected Brio airplane drag reference point. Improved robustness of Tx editor. Fixed Tx calibration for 3rd party interfaces. Updated: When deleting a Tx, now the default is “Universal Tx”. Changed: When copying a stock Tx, it uses the Tx configuration for the currently selected aircraft. Fixed: Solves problem when running two player with only one controller. Second aircraft flies now with neutral controls on all channels. 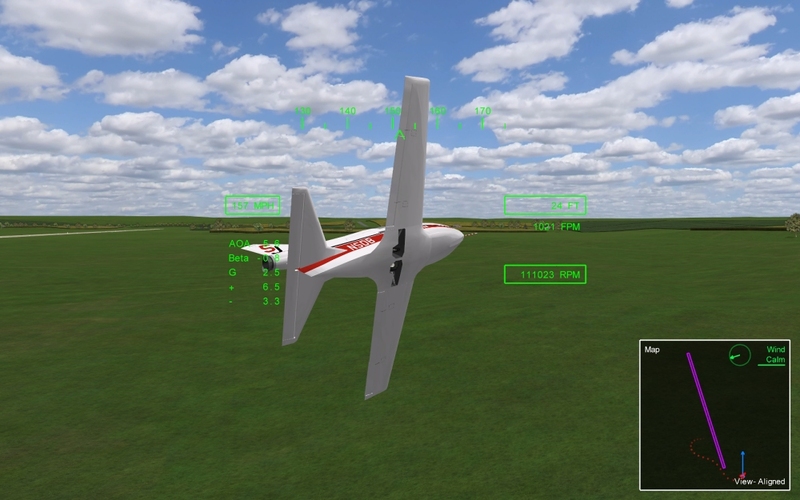 Added: For airplanes, basic aerodynamics data overlay toggled on/off with keypad ‘+’ key. This feature in beta for engineering use only (may change later). When in use, slows down frame rate. Too see the full display, screen resolution should be at least: 1280 x 1024. Added: Message that electric motors for airplanes cannot be killed with ‘k’ key (like glow/gas/jets airplanes). Fixed: Editing of some Tx’s in Tx Editor. High-Resolution Interface – Never before has an RC simulator had this much resolution between your transmitter sticks and computer. Version 2 comes with a new USB interface that has four times more resolution than before (10 bits, 1024 counts). It’s as smooth and accurate as your real transmitter. Better Aerodynamics – Two years of research has improved FS One’s already best-of-breed aerodynamics. You’ll notice this most in 3D maneuvers, but even our beta testers who aren’t 3D hotshots volunteered that they could feel it. 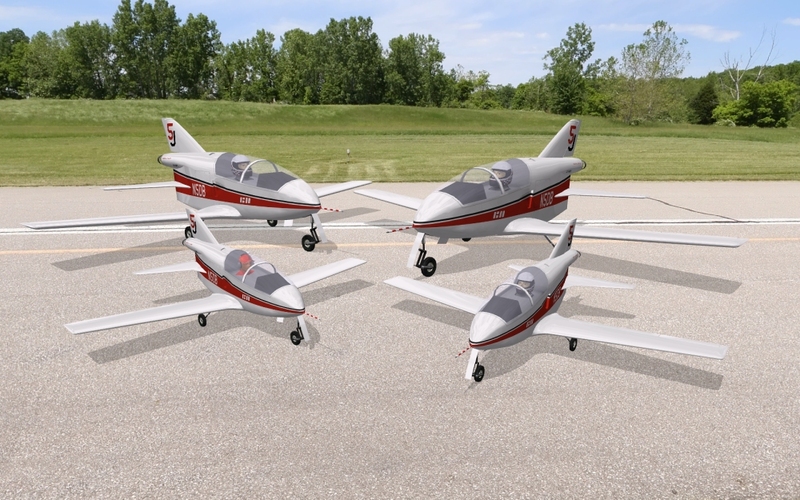 Free Aircraft – Many high-quality aircraft are in the works. The new version 2 supports these free downloads from www.fsone.com. Among the first new airplanes will be the 35% scale Hangar 9 Extra 260. Aircraft – Version 2 has over 40 stock aircraft. This new version bundles in the version 1 Hangar Pack for free. No more Hangar Packs to buy! Leader of the pack – The Scaling Wizard™ by FS One turns any airplane into any size, physics included automatically. The number of airplanes is virtually limitless. Panos and 3D Flying Sites – FS One has both. Fly on board or from the ground, in a 3D world or with photorealistic graphics. Free panos along with free airplanes. Super Easy Transmitter Setup – A Calibration Wizard automatically assigns channels to 4- to 8-channel transmitters. No more long transmitter FAQs. No TacCon! – With the best aerophysics, we’ve made it easy to get the best out of your simulator. Use your own transmitter, and what you feel in the sticks, you’ll feel at the field. Fast Install – Installation is four times faster, and needs no CD-swapping. Updates – Version 2 bundles in all updates to version 1. 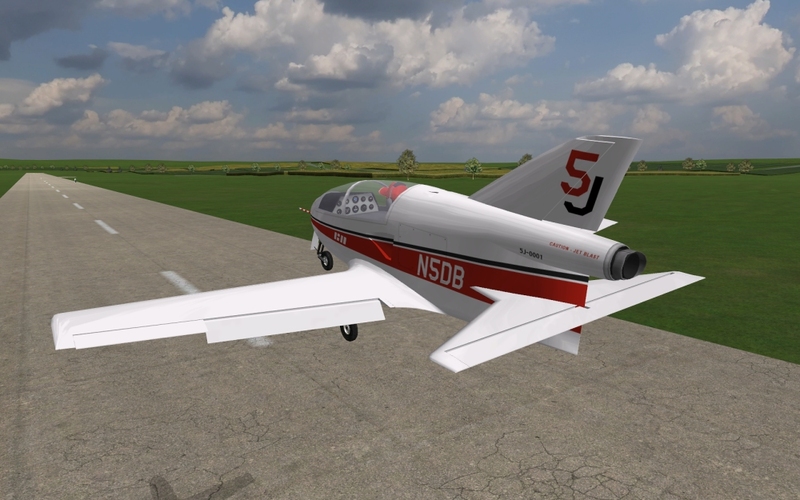 Extras – Download V2 Extras for new aircraft and features, e.g. Electric Sbach 342 with the FS One stability and control augmentation system (SCAS), pylon racing improvements, other ideas we’re testing out for feedback. Moved the example transmitter location from the center to left of center. This reduces the chance that the transmitter will obscure the view of the aircraft, especially when on the ground. Reduced engine sounds when viewing lessons, making it easier to hear the instructor’s voice. Corrected the Physics Menu problems. Improved support for Mode 1 TacCon units. Added a “User Transmitter” category for fixed-wing radios. This version includes all previous updates, plus the heli performance update. This heli performance update improves the flight performance and realism of the heli models. Flight mode switches are reconfigured to match most heli transmitters with the flight mode switch on the left and the throttle hold switch on the right. Pre-existing heli models are retained in a new folder for access unmodified by the performance update. Corrected problem with helis encountering excessive yaw during startup, especially when starting while in stunt (or idle up) mode. For this fix to work properly, the “heli update” should be applied prior to applying the 1_0_9 update. If the update is applied prior to the heli update, simply reinstall the 1_0_9 update after installing the heli update. Corrected undefined region for three position switch for heli TacCon controllers that were deployed with the heli performance update. Improved update functionality to prevent duplicate list entries when repeatedly performing updates. This will eliminate multiple entries in the selection lists/categories. Modified heli start positions to be closer to the pilot location. Heli start positions are now based on the size/class of the heli. For example, smaller helis are located closer than larger helis. Modified heli start positions to allow three start attitudes/directions — pointed away, pointed left, and pointed right. The position can be set via the Options Menu. Added heli landing targets. These landing targets can be turned on/off via the Options Menu. These targets are handy for learning to fly helis and for general practice of precision hovers. All flying sites do not support targets — for example, sites that are not flat near the pilot location do not support targets. Modified calibration procedures for some TacCon controllers. This makes TacCon controllers after the Heli Update have the same calibration behavior as other heli and airplane TacCons. Clarified calibration instructions for TacCon controllers. This should help users ensure that they click the InstantUp button for a proper and complete calibration. Corrected the “Example Transmitter” to show proper axes when used with a heli. Added “Flight Manual” link to the Aircraft Selection Menu and removed the Flight Manual link from the main menu. 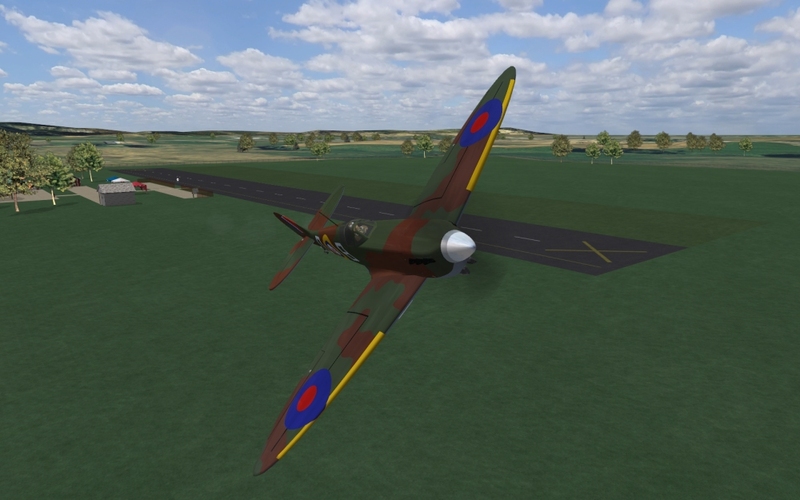 Fixed minor P-factor bug in Edge 540 and J3 Cub aircraft aerodynamics. Increased Edge 540 landing gear side force coefficient to make the gear have more grip when skidding sideways. This version was deployed with Hangar Pack 1. For hi-start and hand-launch starts, throwing angle was changed from 30 deg up/down to 90 deg up/down. Set all padlock cameras (F9/F10 keys) to have autozoom turned off initially. For these cameras, autozoom can be turned on with the ‘a’ key. Added two extra Reverse Padlock cameras to the F10 key. Scaled airplanes, made using the Scaling Wizard ™, now also scale camera distances proportionately. This change only applies to cameras enabled at 3D fields, e.g. cameras F5 and higher. When using hi-start or winch, the u-key for InstantUp now resets the aircraft at its current position. Added the ability to properly detect the Windows Vista operating system. Added an Update folder and related software to support easy updates of aircraft, radios, and pilot figures. Added (R) to logos — FS One is now a registered trademark. Fixed sound problem for various types of sound cards. This fix involved working around incorrect capabilities data reported by the sound driver. Corrected ParkZone SloV 11×3.7 prop data. Corrected Circleville Stock Pavilion sun position. Disabled screensaver and power management while sim is running. This will prevent the screensaver from turning on while FS one is active. Changed wind behavior to allow wind speed and direction changes, even if the wind speed is zero. Corrected the discrepancy between the map display and the wind widget. Added “Help” and “Flight Manual” links to Main Menu. Added an automatic ability to determine if the “options file” is missing or corrupt, and if it is, automatically utilize the default options file. Added a new logbook interface. This provides a nice way to review the total flight time for each aircraft. Corrected a two player radio edit problem that caused problems when editing the “player 2” radio. Previously, if you edited a transmitter in the second position, it edited the transmitter in the first position. This now functions properly. Corrected inertia tensor data scaling problem. Modified the default_options.txt file to change default views (lagged views). Added trademarks section to credits. Expanded limits for max/min from -1.5/+1.5 to -2.0/+2.0 in Edit Transmitter menu. Expanded limits for non-exponential percentages from -150/+150 to -200/+200 in Edit Transmitter menu. Modified aircraft and transmitter name comparison to be case insensitive. Corrected problem where some controllers could not fully complete the calibration sequence. Fixed problem in Edit Transmitter menu when the Source input axis was adjusted. Extended the Input Type drop-down list in the Select Channel Input dialog within the Edit Transmitter menu. Fixed slider display problem when using joystick button input in the Select Channel Input dialog within the Edit Transmitter menu . Corrected CG limit adjustment problem that prevented a negative cg location. Corrected calibration problem that prevented a recalibration after the initial calibration was performed.